That earlier post illustrated a fairly simple example application, the Voter API, consisting of a set of three Spring Boot microservices backed by MongoDB and RabbitMQ, and fronted by an API Gateway built with HAProxy. All API components were containerized using Docker and designed for use with Docker CE for AWS as the Container-as-a-Service (CaaS) platform. 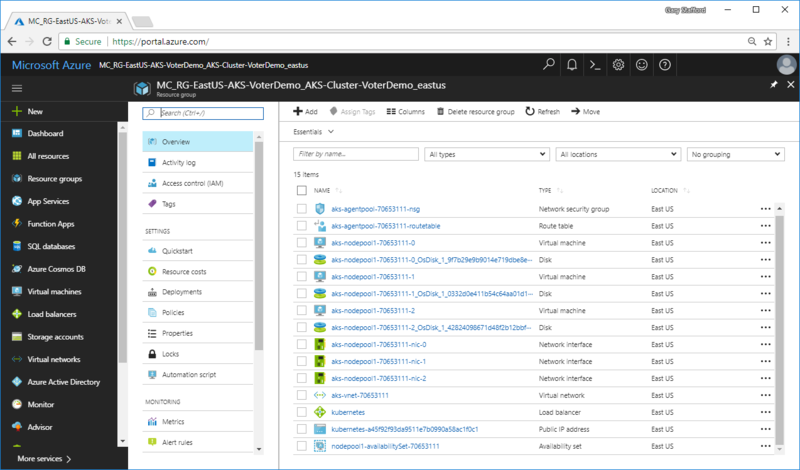 This post will demonstrate how a modern application, such as the Voter API, is optimized for Kubernetes in the Cloud (Kubernetes-as-a-Service), in this case, AKS, Azure’s new public preview of Managed Kubernetes for Azure Container Service. According to Microsoft, the goal of AKS is to simplify the deployment, management, and operations of Kubernetes. I wrote about AKS in detail, in my last post, First Impressions of AKS, Azure’s New Managed Kubernetes Container Service. 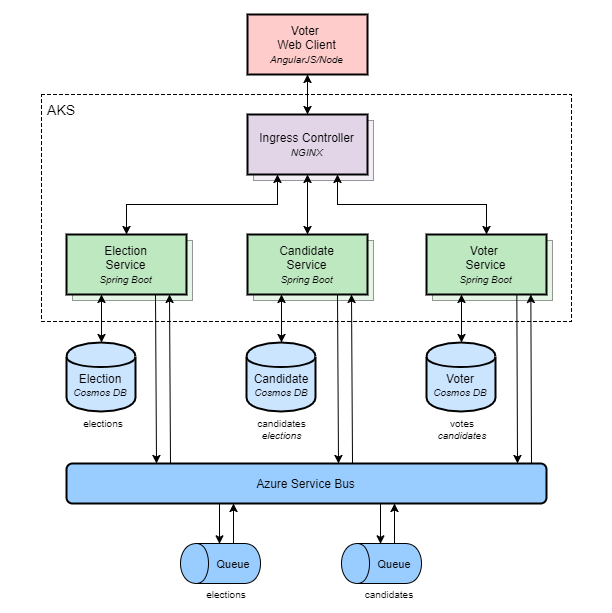 In addition to migrating to AKS, the Voter API will take advantage of additional enterprise-grade Azure’s resources, including Azure’s Service Bus and Cosmos DB, replacements for the Voter API’s RabbitMQ and MongoDB. There are several architectural options for the Voter API’s messaging and NoSQL data source requirements when moving to Azure. Keep Dockerized RabbitMQ and MongoDB – Easy to deploy to Kubernetes, but not easily scalable, highly-available, or manageable. Would require storage optimized Azure VMs for nodes, node affinity, and persistent storage for data. Replace with Cloud-based Non-Azure Equivalents – Use SaaS-based equivalents, such as CloudAMQP (RabbitMQ-as-a-Service) and MongoDB Atlas, which will provide scalability, high-availability, and manageability. Replace with Azure Service Bus and Cosmos DB – Provides all the advantages of SaaS-based equivalents, and additionally as Azure resources, benefits from being in the Azure Cloud alongside AKS. The Kubernetes resource files and deployment scripts used in this post are all available on GitHub. This is the only project you need to clone to reproduce the AKS example in this post. The Docker images for the three Spring microservices deployed to AKS, Voter, Candidate, and Election, are available on Docker Hub. Optionally, the source code, including Dockerfiles, for the Voter, Candidate, and Election microservices, as well as the Voter Client are available on GitHub, in the kub-aks branch. 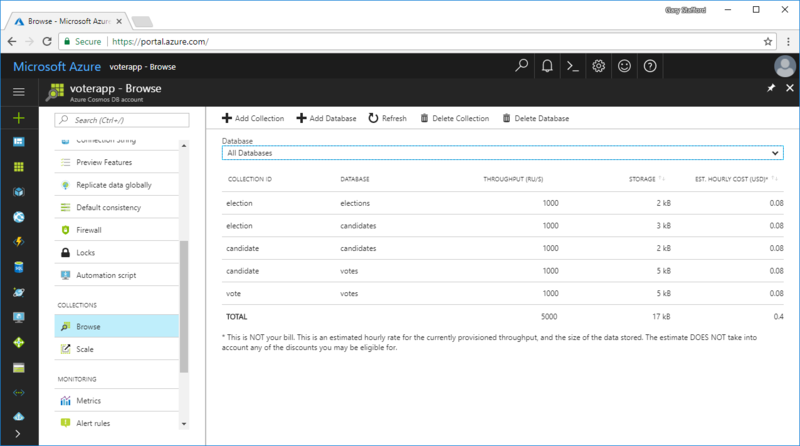 To demonstrate the capabilities of Azure’s Service Bus, the Voter API’s Spring microservice’s source code has been re-written to work with Azure Service Bus instead of RabbitMQ. A future post will explore the microservice’s messaging code. It is more likely that a large application, written specifically for a technology that is easily portable such as RabbitMQ or MongoDB, would likely remain on that technology, even if the application was lifted and shifted to the Cloud or moved between Cloud Service Providers (CSPs). Something important to keep in mind when choosing modern technologies – portability. Since the three Voter API’s microservices are not required to produce messages for more than one other service consumer, Service Bus queues are sufficient, as opposed to a pub/sub model using Service Bus topics. Cosmos DB, Microsoft’s globally distributed, multi-model database, offers throughput, latency, availability, and consistency guarantees with comprehensive service level agreements (SLAs). 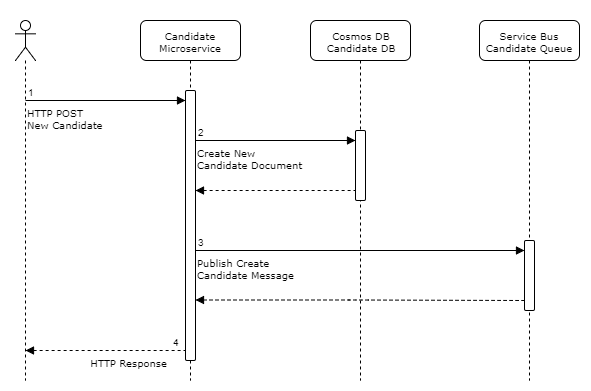 Ideal for the Voter API, Cosmos DB supports MongoDB’s data models through the MongoDB API, a MongoDB database service built on top of Cosmos DB. The MongoDB API is compatible with existing MongoDB libraries, drivers, tools, and applications. Therefore, there are no code changes required to convert the Voter API from MongoDB to Cosmos DB. I simply had to change the database connection string. Although the Voter API’s HAProxy-based API Gateway could be deployed to AKS, it is not optimal for Kubernetes. Instead, the Voter API will use an NGINX-based Ingress Controller. NGINX will serve as an API Gateway, as HAProxy did, previously. There are currently two NGINX-based Ingress Controllers available, one from Kubernetes and one directly from NGINX. Both being equal, for this post, I chose the Kubernetes version, without RBAC (Kubernetes offers a version with and without RBAC). RBAC should always be used for actual cluster security. There are several advantages of using either version of the NGINX Ingress Controller for Kubernetes, including Layer 4 TCP and UDP and Layer 7 HTTP load balancing, reverse proxying, ease of SSL termination, dynamically-configurable path-based rules, and support for multiple hostnames. Lastly, the Voter Client application, not really part of the Voter API, but useful for demonstration purposes, will be converted from a containerized application to an Azure Web App. Since it is not part of the Voter API, separating the Client application from AKS makes better architectural sense. 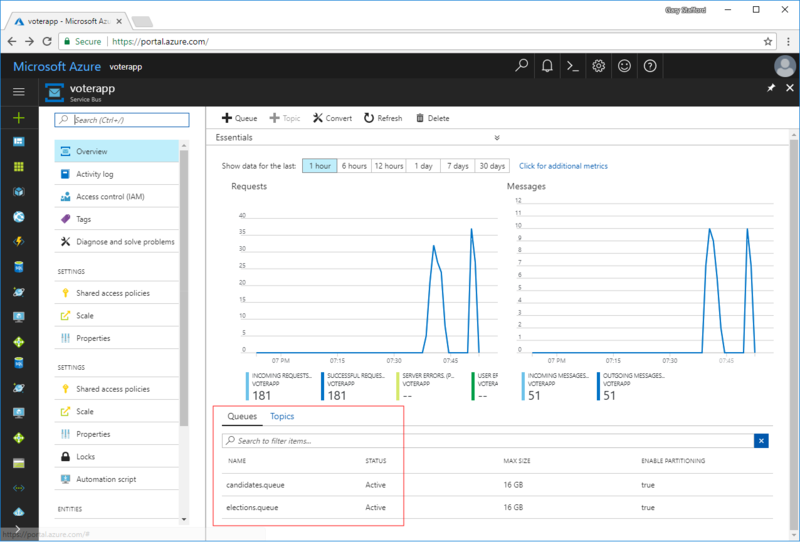 Web Apps are a powerful, richly-featured, yet incredibly simple way to host applications and services on Azure. 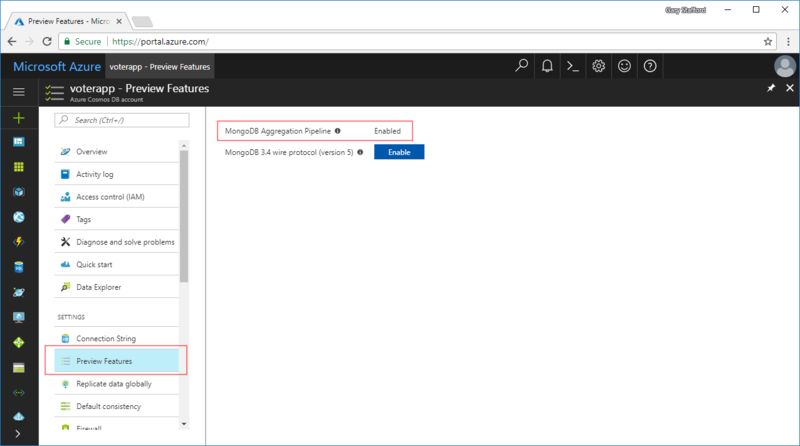 For more information on using Azure Web Apps, read my recent post, Developing Applications for the Cloud with Azure App Services and MongoDB Atlas. Below is a simplified component diagram of the new architecture, including Azure Service Bus, Cosmos DB, and the NGINX Ingress Controller. The new architecture looks similar to the previous architecture, but as you will see, it is actually very different. To understand the role of each API component, let’s look at one of the event-driven, decoupled process flows, the creation of a new election candidate. In the simplified flow diagram below, an API consumer executes an HTTP POST request containing the new candidate object as JSON. The Candidate microservice receives the HTTP request and creates a new document in the Cosmos DB Voter database. 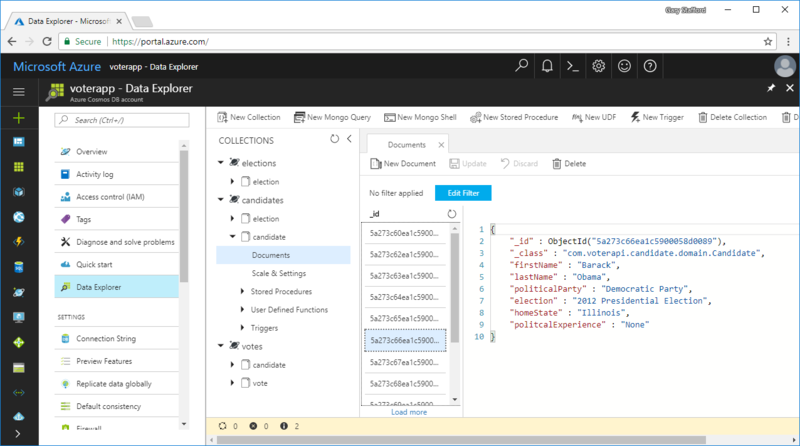 A Spring RepositoryEventHandler within the Candidate microservice responds to the document creation and publishes a Create Candidate event message, containing the new candidate object as JSON, to the Azure Service Bus Candidate Queue. Independently, the Voter microservice is listening to the Candidate Queue. 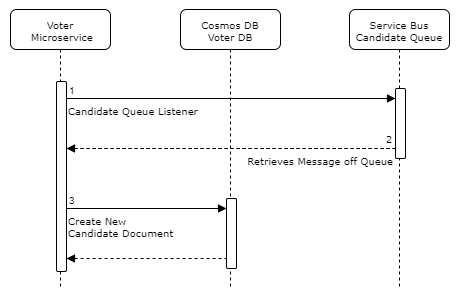 Whenever a new message is produced by the Candidate microservice, the Voter microservice retrieves the message off the queue. The Voter microservice then transforms the new candidate object contained in the incoming message to its own candidate data model and creates a new document in its own Voter database. The same process flows exist between the Election and the Candidate microservices. The Candidate microservice maintains current elections in its database, which are retrieved from the Election queue. It is useful to understand, the Candidate microservice’s candidate domain model is not necessarily identical to the Voter microservice’s candidate domain model. Each microservice may choose to maintain its own representation of a vote, a candidate, and an election. The Voter service transforms the new candidate object in the incoming message based on its own needs. In this case, the Voter microservice is only interested in a subset of the total fields in the Candidate microservice’s model. This is the beauty of decoupling microservices, their domain models, and their datastores. The versions of the Voter API microservices used for this post only support Election Created events and Candidate Created events. They do not handle Delete or Update events, which would be necessary to be fully functional. For example, if a candidate withdraws from an election, the Voter service would need to be notified so no one places votes for that candidate. This would normally happen through a Candidate Delete or Candidate Update event. First, the Azure Service Bus is provisioned. Provisioning the Service Bus may be accomplished using several different methods, including manually using the Azure Portal or programmatically using Azure Resource Manager (ARM) with PowerShell or Terraform. I chose to provision the Azure Service Bus and the two queues using the Azure Portal for expediency. I chose the Basic Service Bus Tier of service, of which there are three tiers, Basic, Standard, and Premium. The application requires two queues, the candidate.queue, and the election.queue. Next, Cosmos DB is provisioned. Like Azure Service Bus, Cosmos DB may be provisioned using several methods, including manually using the Azure Portal, programmatically using Azure Resource Manager (ARM) with PowerShell or Terraform, or using the Azure CLI, which was my choice. The post’s Cosmos DB instance exists within the single East US Region, with no failover. In a real Production environment, you would configure Cosmos DB with multi-region failover. I chose MongoDB as the type of Cosmos DB database account to create. The allowed values are GlobalDocumentDB, MongoDB, Parse. All other settings were left to the default values. The three Spring microservices each have their own database. You do not have to create the databases in advance of consuming the Voter API. The databases and the database collections will be automatically created when new documents are first inserted by the microservices. Below, the three databases and their collections have been created and populated with documents. The GitHub project repository also contains three shell scripts to generate sample vote, candidate, and election documents. The scripts will delete any previous documents from the database collections and generate new sets of sample documents. To use, you will have to update the scripts with your own Voter API URL. Each of the three Spring microservices uses Spring Data MongoDB, which takes advantage of MongoDB’s Aggregation Framework. According to MongoDB, ‘the aggregation framework is modeled on the concept of data processing pipelines. 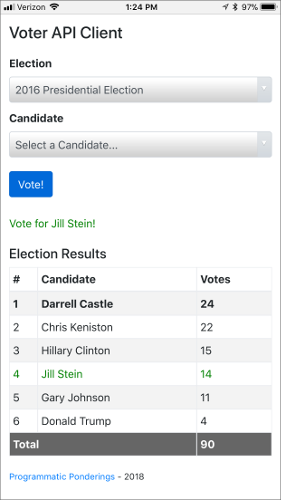 Documents enter a multi-stage pipeline that transforms the documents into an aggregated result.’ Below is an example of aggregation from the Candidate microservice’s VoterContoller class. To use MongoDB’s aggregation framework with Cosmos DB, it is currently necessary to activate the MongoDB Aggregation Pipeline Preview Feature of Cosmos DB. The feature can be activated from the Azure Portal, as shown below. Be warned, Cosmos DB can be very expensive, even without database traffic or any Production-grade bells and whistles. Be careful when spinning up instances on Azure for learning purposes, the cost adds up quickly! In less than ten days, while writing this post, my cost was almost US$100 for the Voter API’s Cosmos DB instance. 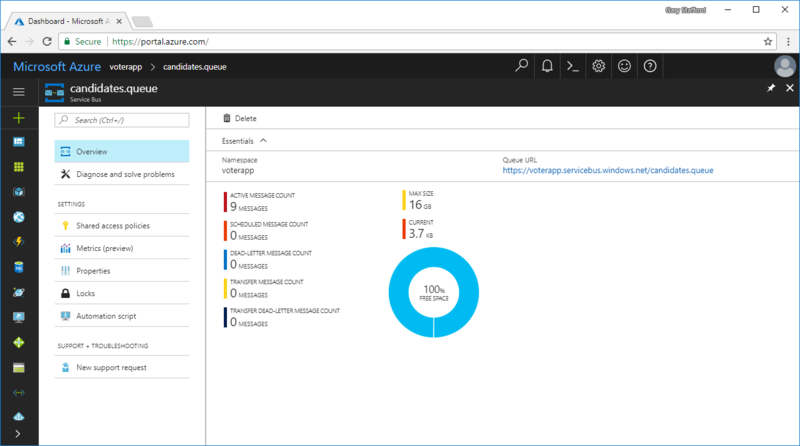 I strongly recommend downloading the free Azure Cosmos DB Emulator to develop and test applications from your local machine. 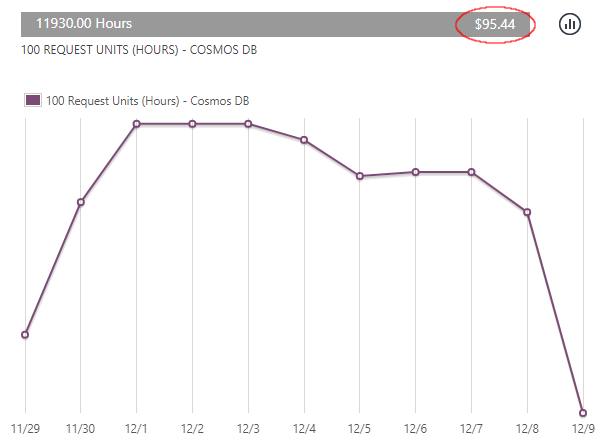 Although certainly not as convenient, it will save you the cost of developing for Cosmos DB directly on Azure. With Cosmos DB, you pay for reserved throughput provisioned and data stored in containers (a collection of documents or a table or a graph). Yes, that’s right, Azure charges you per MongoDB collection, not even per database. Azure Cosmos DB’s current pricing model seems less than ideal for microservice architectures, each with their own database instance. By default the reserved throughput, billed as Request Units (RU) per second or RU/s, is set to 1,000 RU/s per collection. For development and testing, you can reduce each collection to a minimum of 400 RU/s. The Voter API creates five collections at 1,000 RU/s or 5,000 RU/s total. Reducing this to a total of 2,000 RU/s makes Cosmos DB marginally more affordable to explore. An existing Azure Resource Group is required for AKS. I chose to use the latest available version of Kubernetes, 1.8.2. By default, AKS will provision a three-node Kubernetes cluster using Azure’s Standard D1 v2 Virtual Machines. According to Microsoft, ‘D series VMs are general purpose VM sizes provide balanced CPU-to-memory ratio. They are ideal for testing and development, small to medium databases, and low to medium traffic web servers.’ Azure D1 v2 VM’s are based on Linux OS images, currently Debian 8 (Jessie), with 1 vCPU and 3.5 GB of memory. By default with AKS, each VM receives 30 GiB of Standard HDD attached storage. You should always select the type and quantity of the cluster’s VMs and their attached storage, optimized for estimated traffic volumes and the specific workloads you are running. This can be done using the --node-count, --node-vm-size, and --node-osdisk-size arguments with the az aks create command. The Voter API resources are deployed to its own Kubernetes Namespace, voter-api. The NGINX Ingress Controller resources are deployed to a different namespace, ingress-nginx. Separate namespaces help organize individual Kubernetes resources and separate different concerns. 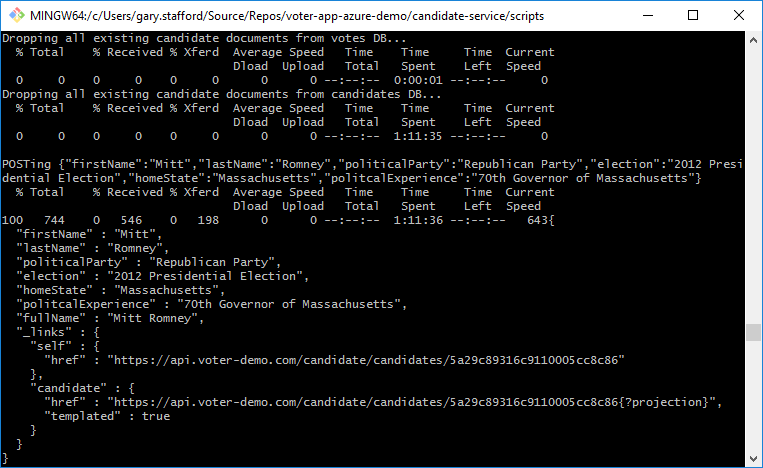 First, the voter-api namespace is created. Then, five required Kubernetes Secrets are created within the namespace. These secrets all contain sensitive information, such as passwords, that should not be shared. There is one secret for each of the three Cosmos DB database connection strings, one secret for the Azure Service Bus connection string, and one secret for the Let’s Encrypt SSL/TLS certificate and private key, used for secure HTTPS access to the Voter API. The Voter API’s secrets are used to populate environment variables within the pod’s containers. The environment variables are then available for use within the containers. Below is a snippet of the Voter pods resource file showing how the Cosmos DB and Service Bus connection strings secrets are used to populate environment variables. Shown below, the Cosmos DB and Service Bus connection strings secrets have been injected into the Voter container and made available as environment variables to the microservice’s executable JAR file on start-up. As environment variables, the secrets are visible in plain text. Access to containers should be tightly controlled through Kubernetes RBAC and Azure AD, to ensure sensitive information, such as secrets, remain confidential. Next, the three Kubernetes ReplicaSet resources, corresponding to the three Spring microservices, are created using Deployment controllers. According to Kubernetes, a Deployment that configures a ReplicaSet is now the recommended way to set up replication. The Deployments specify three replicas of each of the three Spring Services, resulting in a total of nine Kubernetes Pods. Each pod, by default, will be scheduled on a different node if possible. According to Kubernetes, ‘the scheduler will automatically do a reasonable placement (e.g. spread your pods across nodes, not place the pod on a node with insufficient free resources, etc. ).’ Note below how each of the three microservice’s three replicas has been scheduled on a different node in the three-node AKS cluster. Next, the three corresponding Kubernetes ClusterIP-type Services are created. And lastly, the Kubernetes Ingress is created. According to Kubernetes, the Ingress resource is an API object that manages external access to the services in a cluster, typically HTTP. Ingress provides load balancing, SSL termination, and name-based virtual hosting. The Ingress configuration contains the routing rules used with the NGINX Ingress Controller. Shown below are the routing rules for each of the three microservices within the Voter API. Incoming API requests are routed to the appropriate pod and service port by NGINX. The screengrab below shows all of the Voter API resources created on AKS. After completing the deployment of the Voter API, the NGINX Ingress Controller is created. It starts with creating the ingress-nginx namespace. Next, the NGINX Ingress Controller is created, consisting of the NGINX Ingress Controller, three Kubernetes ConfigMap resources, and a default back-end application. The Controller and backend each have their own Service resources. Like the Voter API, each has three replicas, for a total of six pods. Together, the Ingress resource and NGINX Ingress Controller manage traffic to the Spring microservices. The screengrab below shows all of the NGINX Ingress Controller resources created on AKS. The NGINX Ingress Controller Service, shown above, has an external public IP address associated with itself. This is because that Service is of the type, Load Balancer. External requests to the Voter API will be routed through the NGINX Ingress Controller, on this IP address. If you are only using HTTPS, not HTTP, then the references to HTTP and port 80 in the Ingress configuration are unnecessary. The NGINX Ingress Controller’s resources are explained in detail in the GitHub documentation, along with further configuration instructions. To provide convenient access to the Voter API and the Voter Client, my domain, voter-demo.com, is associated with the public IP address associated with the Voter API Ingress Controller and with the public IP address associated with the Voter Client Azure Web App. DNS configuration is done through Azure’s DNS Zone resource. The two TXT type records might not look as familiar as the SOA, NS, and A type records. 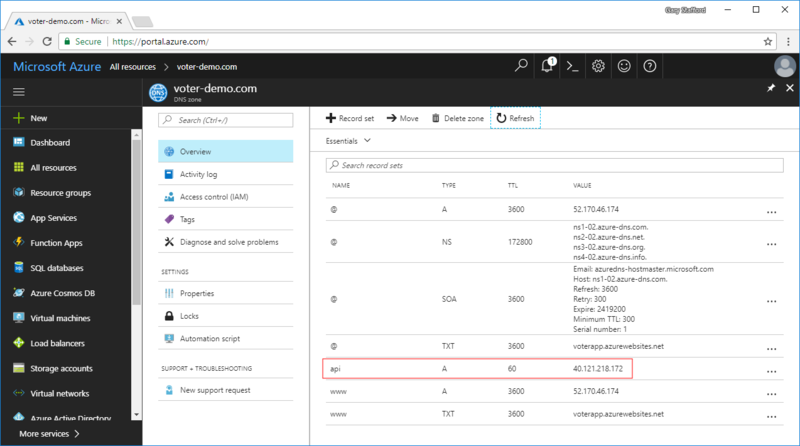 The TXT records are required to associate the domain entries with the Voter Client Azure Web App. Browsing to http://www.voter-demo.com or simply http://voter-demo.com brings up the Voter Client. The Client sends and receives data via the Voter API, available securely at https://api.voter-demo.com. With the Pods, Services, Ingress, and NGINX Ingress Controller created and configured, as well as the Azure Layer 4 Load Balancer and DNS Zone, HTTP requests from API consumers are properly and securely routed to the appropriate microservices. In the example below, three back-to-back requests are made to the voter/info API endpoint. HTTP requests are properly routed to one of the three Voter pod replicas using the default round-robin algorithm, as proven by the observing the different hostnames (pod names) and the IP addresses (private pod IPs) in each HTTP response. Shown below is the final Voter API Azure architecture. To simplify the diagram, I have deliberately left out the three microservice’s ClusterIP-type Services, the three default back-end application pods, and the default back-end application’s ClusterIP-type Service. All resources shown below are within the single East US Azure region, except DNS, which is a global resource. Shown below is the new Azure Resource Group created by Azure during the AKS provisioning process. The Resource Group contains the various resources required to support the AKS cluster, NGINX Ingress Controller, and the Voter API. Necessary Azure resources were automatically provisioned when I provisioned AKS and when I created the new Voter API and NGINX resources. In addition to the Resource Group above, the original Resource Group contains the AKS Container Service resource itself, Service Bus, Cosmos DB, and the DNS Zone resource. The Voter Client Web App, consisting of the Azure App Service and App Service plan resource, is located in a third, separate Resource Group, not shown here. A nice feature of AKS, running a az aks delete command will delete all the Azure resources created as part of provisioning AKS, the API, and the Ingress Controller. You will have to delete the Cosmos DB, Service Bus, and DNS Zone resources, separately. 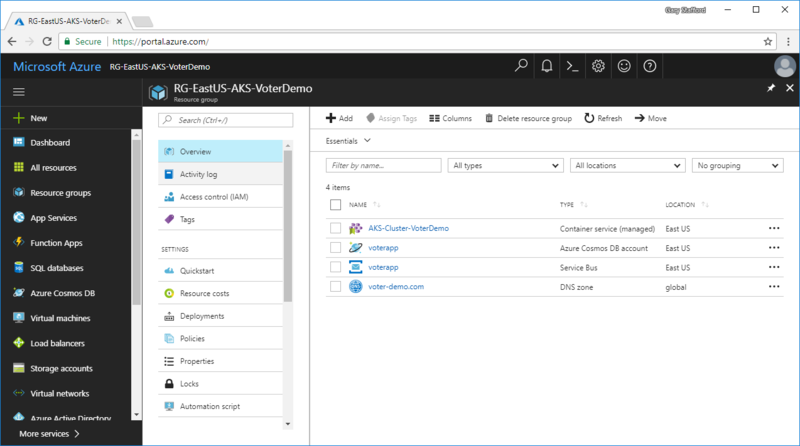 Taking advantage of Kubernetes with AKS, and the array of Azure’s enterprise-grade resources, the Voter API was shifted from a simple Docker architecture to a production-ready solution. The Voter API is now easier to manage, horizontally scalable, fault-tolerant, and marginally more secure. It is capable of reliably supporting dozens more microservices, with multiple replicas. The Voter API will handle a high volume of data transactions and event messages.